1 Rationale: Why is this case study interesting? 10.1 How may landscape architecture contribute to the integration of different user groups in the urban fringe? 10.2 How can the transformation process be connected with the landscape sub-typologies? 10.3 How may landscape planning contribute to quality improvement? 10.4 Can the maintenance and development of agricultural land-use in urban fringes be a strategy of a greenbelt? 14 What can be generalized from this case study? 15 Which research questions does it generate? Rationale: Why is this case study interesting? it would be forged to serve as a green lung for new city center? On the political aspect, due to the very location of Yanjiao, which belongs to the big Peking economic circle, local government is intended to maximize the scope of the whole town. 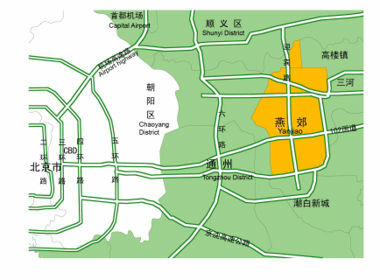 The viewpoint of landscape architect is on the contrary.Regarding the severe fragmentation of the landuse in peri-urban area close to Peking, the crucial issue is that if the build up of greenbelt could virtually work as a barrier to isolate the building up of the city from the farming land. This case study is firstly applied as the main topic of bachelor thesis by Ran Tao,Beijing Forestry University.In the very beginning,the purpose of the project, as the very pioneer work central park in new York city has established, is to spare a recreational area in advance. As a matter of fact,the development of Yanjiao is a mirror reflecting the urbanization of rural area in China. With the re construction of economics, with the redundancy of farming population surging to the city to seek to work chance, the urbanization trends seems to be irreversible.However, how to deal with the change in a sustainable way is the key issue of landscape architecture profession in the next several years. Here we extract this whole story, to formulate two possible consequence of the ending. Yanjiao, literally the surburb of the Kingdom Yan(Peking), is 30km away from Tian'anmen Square, 25Km away from Capital airport. Located in Yanshan Plain, which is originated from the alluvial deposition from ChaoBai river,JiYun river, the average level of Yanjiao is 5.9-31.9 meter above Huanghai. The site of this project is situated on the border of Yanjiao town and Gaoqiao town.Compared to Yanjiao,Gaoqiao(literaly High bridge)is less urbanized,in which vast majority of farming land are maintained. 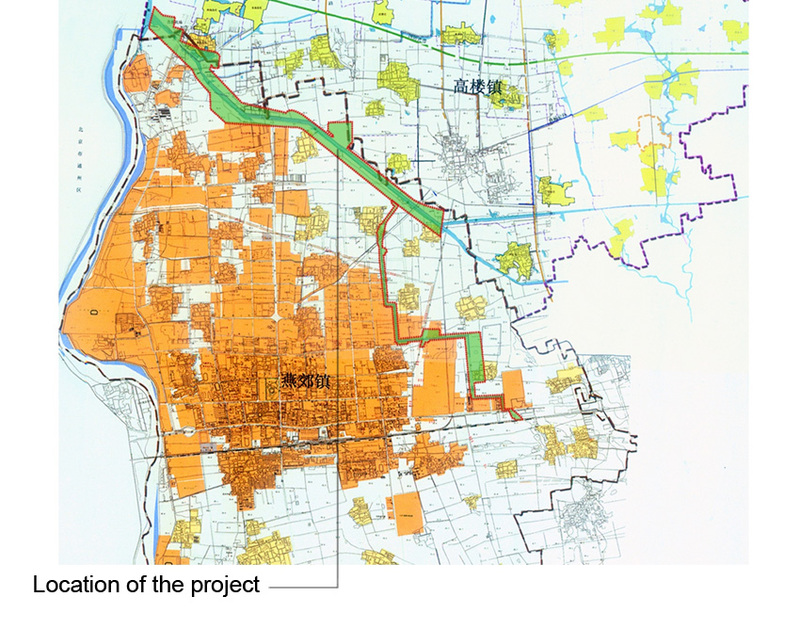 With the population explosion and ireversible urban development of Metropolitan Peking and the adjancent town, Yanjiao and Gaoqiao are quite likely to be virtually converted to the satellite town of Peking(see also political context). The outlook of this greenbelt project is afterall ambiguous.If the urbanization keeps its pace to speed up. the greebelt may serve as a sheer recreation site for local inhabitants in which sense will lose its rural property. In another case, when the urban development managed to be curbed.The greenbelt may act as a joint for urbanized area and rural farming land. Even the very first origin of Yanjiao is closely linked to Peking.It flourished with the booming of Peking, sinked in oblivion with the fall of the city. However,entering into the 21th centry, the relationship between Peking and Yanjiao comes in to a dilema. The urban development of Peking follows a evenly expanding fashion, only in a decade, the edge of the city was pushed from ring 2,3 to ring 5,6.Furthermore, the consistent expanding trend seems hard to be impeded at least in the next decade. Due to the congregation of population in the city center, more hints show that a new inclination of migrating towards the rural area which adjancent to Peking, has been developed. Yanjiao is naturally a perfect place to settle down for most young immigrants.Actually, the sale of real estate in Yanjiao has soared to a new high in the recent several years, which, act as a fuse to induce the new exploit of the residential area in this region. To this point,the local government is intended to grasp the chance to develope by strengthening the relationship between Yanjiao and Peking. However, the barrier, which hinder the bridging of co-developement of Yanjiao and Peking, exist in the political framework. Diverged to Western urban development, Chinese urban developement strictly adhere to the political framework, drafted by central government. Regarding the administration framework of The metropolitan city Peking, Yanjiao is definitely excluded. If Yanjiao need to develop, how to develop, where to develop became the main issue not only in the field of economics bu also urban and landscdape planning. The embarkment of the greenbelt "fecility" encounter the challenge in this sense. How did the area/project/plan at the focus of the case study evolve? What are the main structural features? How has it been shaped? Were there any critical decisions? What are the main functional characteristics? How have they been expressed or incorporated? How was the area/project/plan formulated and implemented? Were there any important consultations/collaborations? How is the area/project/plan used and by whom? Distictive difference would be figured out in case of the various outlook. Once served as a recreational area, the user group would mainly be the local inhabitants When served as a isolation between farming land and urbanized area, the composition of user group may be complicated. Is the use changing? Are there any issues? How may landscape architecture contribute to the integration of different user groups in the urban fringe? How can the transformation process be connected with the landscape sub-typologies? How may landscape planning contribute to quality improvement? Can the maintenance and development of agricultural land-use in urban fringes be a strategy of a greenbelt? 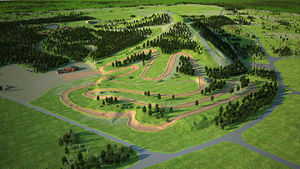 How is the area/project/plan evolving? Are there any future goals? Has the area/ project/plan been reviewed by academic or professional reviewers? What were their main evaluations? What do you see as the main points of success and limitations of the area/project/plan? What can be generalized from this case study? Are there any important theoretical insights? Which research questions does it generate? This page was last modified on 3 August 2013, at 17:47.